Khao Sok National Park’s 165 square kilometer reservoir provides easy bird watching opportunities. We paddle a bit, then sit and watch the activities in the thick jungle. It’s very easy. Besides a variety of monkeys and other mammals, the diversity of bird life is nothing short of thrilling! If you’re looking to add birds to your life list, Khao Sok National Park will certainly fit the bill. Khao Sok can be part of an extended tour of Southern Thailand. Phang Nga Province is within an hour’s drive from Phuket. There are a couple of nice forest parks and a wildlife sanctuary that offer superb birding. Pittas, broadbills, barbets, babblers, warblers, flowerpeckers, sunbirds, kingfishers and many more bird families reside in this special area. Phang Nga Province is a piece of traditional Thailand. There are 54 species of hornbill worldwide. Thailand has 13 species. 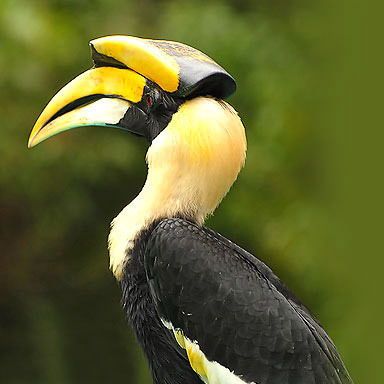 You can see 8 species of hornbill in Khao Sok National Park. There are many families of birds in Thailand. Uncommon and rare birds are fairly easy to see if you visit the right place. Thailand, unlike her neighbors, is a prosperous country and therefore the locals don’t need to eat wild birds to survive. This is great news for birders. All of Southern Thailand’s kingfishers are colorful. From the comfort of a kayak, they’re easy to see as well. 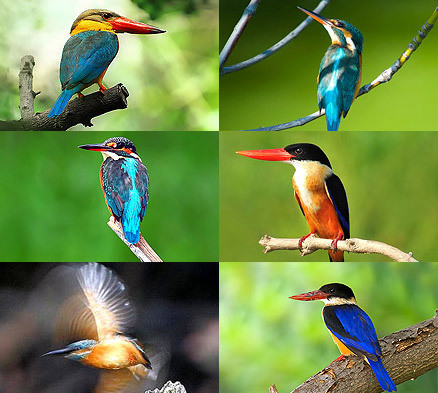 There are 86 species of kingfishers worldwide. Thailand has 15 species. Most of them have bright plumage. Kingfishers typically perch in trees in an upright exposed posture. They often plunge-dive in the water for food. They eat fish, shrimp, other small aquatic animals, insects and occasionally small terrestrial animals such as lizards. Some species, such as the White-throated kingfisher, inhabit inland areas. They’re commonly seen around rice fields looking for lizards, frogs, and insects. They’re absolutely stunning when the sunlight hits their beautiful shiny blue feathers. Rufous-collared Kingfisher – rarely seen, sometimes heard in one area of Khao Sok.